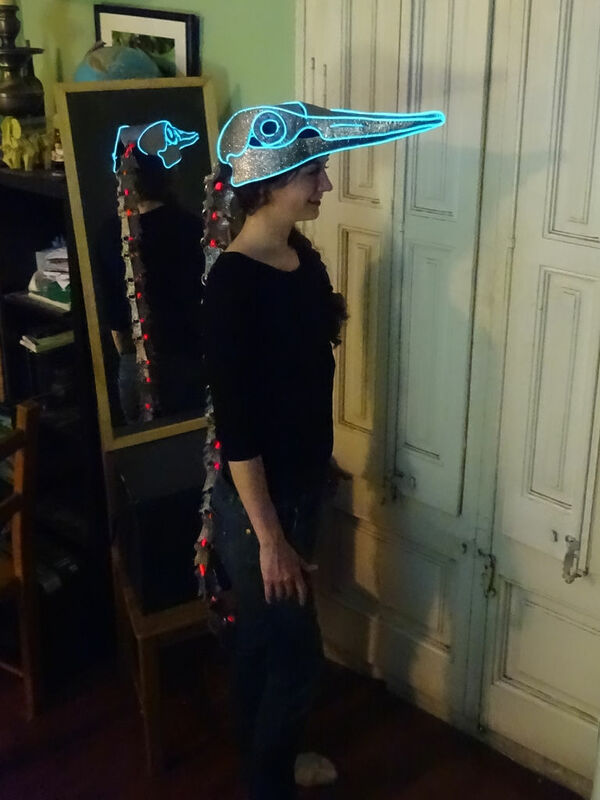 How to Make an EL Wire Bird Headdress #WearableWednesday « Adafruit Industries – Makers, hackers, artists, designers and engineers! 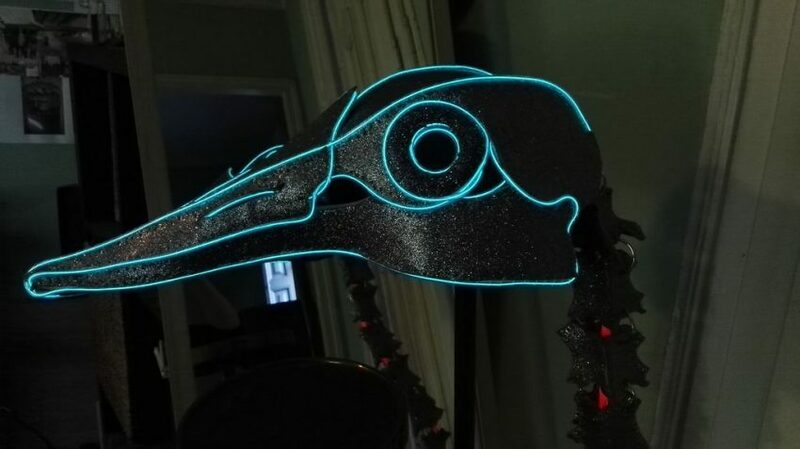 I love the look of this bird skeleton headdress, from its EL wire skull to its glowing articulating spine. This is another masterpiece by CathyB12 on Instructables, who has also made a dragon headdress. As you might guess, most of the project is made of layered craft foam with blue EL wire. The more interesting part of the assembly is the spine, which uses smaller pieces of craft foam joined with binder rings to mimic vertebrate, creating a tunnel for an EL wire bundle in red. It’s really a great look! 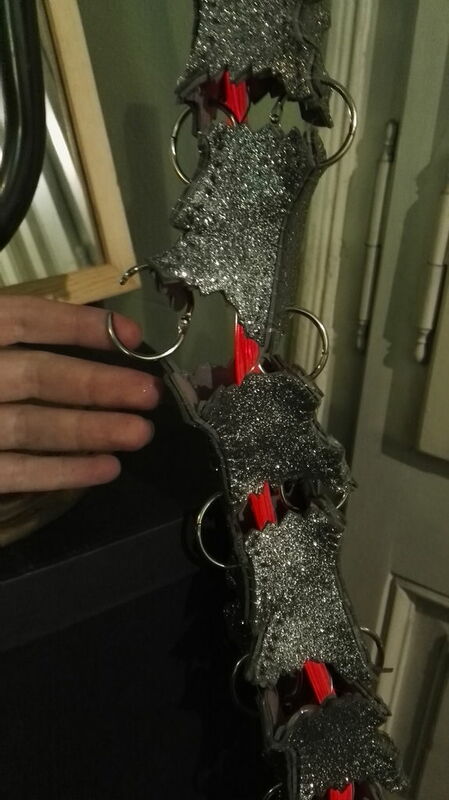 Here is the finished piece with its long links swinging. The EL wire has a sound sensitive controller, so it’s great for Burning Man style events with music. This design is so well done that I think Kathy should be attempting to make glowing costume pieces that resemble the scary creatures in Alien. She’s great at marrying primitive structure with modern elements. If you want to learn how to create EL wire art of your own, check out our learning guide on EL Wire Animal Masks. You can make an outline of your favorite creature and create a specific dance to honor it. Actually that last part is not required, but we think it might be fun. Time to glow!